We have realized that a significant number of our customers were using HYDRUS to obtain subsurface flow conditions and in turn using them in the slope-stability analysis, evaluated subsequently in other programs. This motivated us to offer a new module that would simplify this work. The Slope Classic (SLOPE) add-on module is intended to be used mainly for stability checks of embankments, dams, earth cuts and anchored sheeting structures. The influence of water is modeled using the distribution of pore pressure, which is imported automatically from the HYDRUS results for specified times. Each time step of water distribution can be analyzed separately. The slip surface is considered as circular (and is evaluated using the Bishop, Fellenius/Petterson, Morgenstern-Price or the Spencer method). More information can be found in the user manual. The Slope Stability module was developed in the context of our long-term cooperation with the FINE company, one of world's leading developers of geotechnical software. FINE has been developing and supplying programs for structural and geotechnical engineers since 1989, which guarantees deep professional knowledge of this area, including an extensive experience with real-world customer's projects. 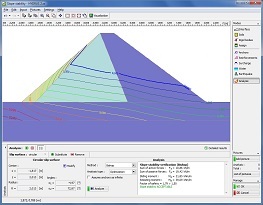 The Slope Stability module combines FINE's geotechnical software with the HYDRUS model and represents thus a sophisticated tool for the stability analysis of embankments, dams, earth cuts and anchored sheeting structures under a critical influence of water. The Slope Stability module is fully incorporated into HYDRUS, and hence will be installed automatically together with the HYDRUS software package. Slope Stability demo version is part of the standard HYDRUS demo version. This demo version can be used (without any restriction) for the analysis of Slope Stability without the influence of water. The water influence requires a valid license for the module. HYDRUS installation program includes several examples of the Slope Stability analysis. After installation of HYDRUS, these examples can be found in HYDRUS Project Manager (see project group "Slope Stability"). Many practical applications can be viewed at http://www.finesoftware.eu/projects/.